Some weeks back I looked at the Lowa Renegade II GTX Mid Hiking Boots for men, a pair of hiking boots I am a fan of and use for my summer hiking. Today I want to take a look at the version of the same boot for women. The Renegade Mid GTX are an excellent pair of hiking boots. Good for year round use, more a 2 to 3 season pair of hiking boots but they're an overall excellent choice for day hiking. Lowa are a very well established and respected brand so I am not surprised to find that they have in their product arsenal one of the top-rated hiking boots available on the market today. After all, they've been making hiking boots for a long time. As with the Men's version of this boot, the first thing I should say about this boot is that, to the best of my knowledge, it is one of Lowa's best sellers and has been for a while now. The Lowa Renegade GTX Mid boots for women look like a hiking boot should. That is, functional and comfortable. However, it is worth mentioning, for you fashionista's out there, that there are some bright color schemes available for this boot, the red version is pretty hard to miss 🙂 With over 12 color options to choose from, there will be something in there to suit your taste. The footbed has built in moisture wicking capability and so the internal climate around your feet is controlled. Moisture is wicked away from your feet. This is really good to have and it is an often overlooked feature in hiking boots. Moisture and heat mixed with movement for long periods can lead to blisters, and we certainly want to avoid those while putting in the miles out on the trail. The Nubuck leather upper holds feet firmly and safely in place which all goes to reducing strain on your toes, particularly important on the downhll. The boot is also reasonably lightweight coming in and around 2.3 pounds (1.04 Kgs), and utilizes monowrap midsole technology. The Renegade is waterproof using breathable gore-tex so you should, pretty much, have a year round light hiking boot here working in both drier and sunnier conditions. The outsole on the Renegade, pictured above, is Vibram and features thick, nonslip rubber lugs which provide extra traction on the trail. Very important when hiking over wet rocks or terrain on the harder days of the year. Finally, the Derby lacing system, pictured to the right, means that Lowa Renegade GTX Mid hiking boots can be adapted to fit most foot shapes. Functionally, I would put this boot's 'best use' so to speak as average hiking and light backpacking. They're also perfect for general outdoor use as well as for day-to-day wearing. Read user reviews on Amazon. As with the men's version of these boots, the Lowa women's Renegade GTX Mid Hiking Boots are one of the best available on the market today. They're functional and have a very long history and lots of very positive user feedback and reviews. I think this boot is perfect for an average hiker doing mainly day hikes, sticking mainly to trails and less rugged terrain in generally temperate or warm conditions. These boots should keep you sweet for that and short camping trips too. The jury count is in, all in all, the verdict is they look like a great pair of hiking boots! If you're still unsure what type of hiking boots you should get, check out the hiking boot buying guide and some top hiking boot recommendations. That will get your search off on a sound footing! 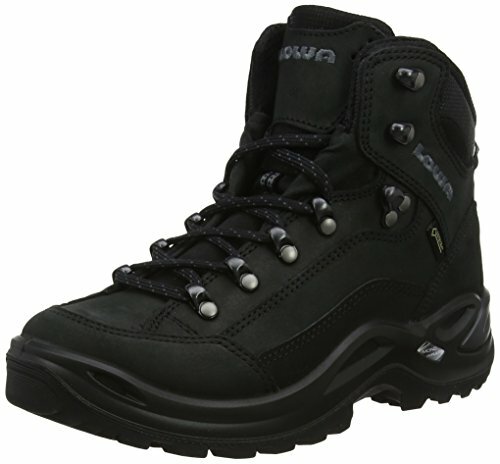 Have you tried the Lowa Renegade GTX Mid Hiking Boots? What's your experience with them out on the trail? I’d love to hear about it in the comments below.